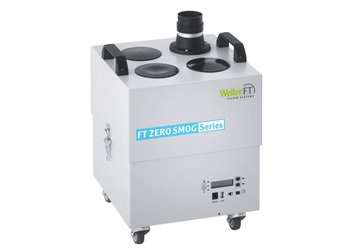 The Weller WFE P is a line voltage fume extraction unit designed to run with one or two FE (Fume Extraction) soldering irons. 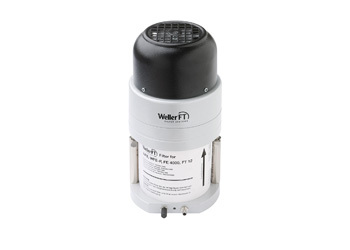 The WFE P has an electric, long-life, soundproofed vacuum pump to produce the required vacuum – it does not need a compressed air supply. The vacuum pump has two power settings which can be selected by means of rocker switches depending on the number of FE soldering irons connected to the unit. This saves energy. The motor is maintenance-free and has a thermal over load to protect the unit. Unit purifies air at up to 4 workplaces Constant Flow Control (CFC) guarantees automatical air flow regulation for each working place independent of the connected workplaces Electronic filter control with optical and acoustical filter alarm Efficiency test via USB port The fume extraction unit Zero Smog 4V Kit 1 Funnel is easy to install and operate. It is designed for use as a small central system. The kit is supplied complete with 1.pcs flexible hose, flexarm, funnel nozzle, valve and bracket, ready for installation at the workplace. 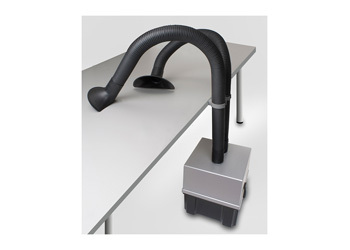 Efficiency test via USB port Unit purifies air at up to 8 workplaces Only one 60 mm hose connector included. 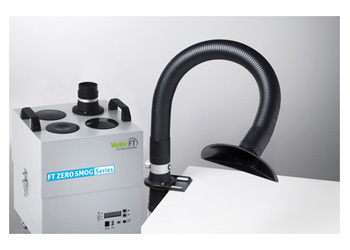 Additional connectors muß ordered seperat The fume extraction system Zero Smog 6V (ZS 6V) is user-friendly with quick and simple installation and filter exchange. It has a low noise emission level and is small and convenient to locate within the work area.